Entrapment, then jail for birth control? Not for abortion, for birth control? The idea would be ludicrous if not for the recent use of entrapment and edited videos trying to establish the ‘guilt’ of family planning providers allegedly ‘selling’ fetal remains after legal abortions. The attack here is on family planning providers, and Planned Parenthood in particular, with Congress and state legislatures trying eliminate their funding, thereby forcing Planned Parenthood to close its doors and stop serving patients unable to pay. I fear a world where poor women are back to where they were 100 years ago, when the only available methods were uncertain diaphragms, and more uncertain recipes for douches and suppositories, and, of course, withdrawal and the male condom, thus giving men, not women, control of reproduction, which is the ultimate goal of abortion opponents. There is a sordid history to entrapment being used against advocates of reproductive freedom. One hundred years ago, opponents of legal birth control had succeeded in passing laws outlawing all methods to prevent conception, as well as any speech advocating the legalization thereof. These laws, called the Comstock Laws, named after Anthony Comstock, the nation’s leading anti-vice crusader, were enacted before my grandmother, Margaret Sanger, coined the term, ‘birth control’ in 1914 in her newspaper, The Woman Rebel. This anarchist paper, for a variety of reasons, raised the ire of the authorities, and in October 1914 she was indicted, among other counts, for violating the nation’s Comstock Laws for advocating the legalization of birth control. She never actually gave any birth control information in the paper, but, before fleeing to Europe to avoid being railroaded to jail for her advocacy, she penned a 16-page pamphlet, Family Limitation, which gave information on various douches, suppositories and other rudimentary methods of the day. Anthony Comstock was not amused. In January 1915, he sent an undercover police officer to the architectural office of my grandfather, William Sanger, who was estranged from, but still legally married to, my grandmother. The officer, claiming to be a Mr. Heller and a colleague of my grandmother, asked for one of her pamphlets in order to translate it into several languages to distribute among the poor. My grandfather believed this tale and, rummaging through my grandmother’s belongings, which she had left behind in her hasty departure, found a copy of Family Limitation, delivered it to Mr. Heller and was arrested for violating the Comstock Laws. The New York Comstock Law prohibited: uttering an advertisement purporting to give information where, how, when, of who, and by what means an article purporting to be for immoral use, could be obtained.” Contraception was “immoral” under the law, and thus illegal. Not surprisingly, condoms were not illegal, since they could be used for the cure or prevention of venereal disease; only women-controlled methods were illegal. Comstock offered my grandfather a deal: I’ll drop the charges if you tell me where your wife is. Even though estranged, my grandfather was ever hopeful of reconciliation and refused to turn his wife in. On September 10, 1915, my grandfather went to trial before a three-judge criminal court, having been denied a jury trial. He freely admitted handing over the pamphlet but then declared that the law and not he was on trial. He went on to call Comstock a “religious and pornographic fanatic” and “the victim of incurable sexophobia.” He continued, “I deny the right of the state to encroach on the rights of the individual by invading the most private and fundamental relations of men and women.” Fifty years later, the US Supreme Court in Griswold v. Connecticut would use similar language to overturn the last of the nation’s Comstock Laws. My grandfather was given a choice of $150 fine or 30 days in jail. He chose jail. “I will never pay that fine. I would rather be in jail for my conviction than to be free at a loss of my manhood and my self respect.” My grandfather’s supporters erupted in protest and the court was cleared. Thus the first person put in jail in my grandmother’s birth control crusade was not my grandmother, it was my grandfather. 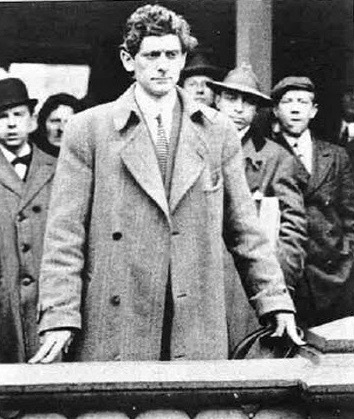 More importantly, the trial and sentence aroused the conscience of the nation, Anthony Comstock became a laughing stock, and his laws were doomed to be ignored, repealed or overturned. Entrapment of reproductive freedom advocates will fail. Civil disobedient women in the future will go to jail for taking the Pill, and, judges, like Justice McInerney, will lecture them on their duty to have children and submit to their husbands. There aren’t jails enough in this country to hold the women who would rather be in jail with their womanhood and self-respect intact than be told what to do with their bodies and their lives.